Best of ASCO Lebanon co-chairs (left to right) Dr. Joseph Makdessi, Dr. Nagi El Saghir, and Dr. Sana Al-Sukhun. Best of ASCO Lebanon participants from Jordan, Syria, Iraq, Egypt, Belgium, the U.S., and Lebanon. Photos courtesy of Hasan Nisr. The Lebanese Society of Medical Oncology (LSMO) held its 12th annual Best of ASCO meeting at Phoenicia Hotel in Beirut, Lebanon. The 2017 Best of ASCO Lebanon, licensed by ASCO, was held for the first time in collaboration with the Jordanian Oncology Society (JOS). JOS used to hold “Highlights of ASCO” annually in Amman to discuss new and practice-changing data presented at ASCO. This year, both societies decided to combine efforts and hold a Best of ASCO meeting together, creating another opportunity for cooperation and interaction in the Middle East region. The meeting was attended by over 300 oncology physicians, speakers, and attendees, who came from all over the Middle East, Europe, and the United States. As usual, and as per ASCO regulations, the Planning Committee included abstracts selected by ASCO’s Best of ASCO committee, in addition to two select Education Sessions. Speakers included Fadlo Khuri, MD, president of the American University of Beirut and editor in chief of Cancer (@DrFadloKhuri), Ahmad Awada, MD, chair of Medical Oncology at the Bordet Intitute of Brussels, Belgium, Toni Choueiri, MD, chair of Uro-Oncology at the Dana Farber Cancer Center (@DrChoueiri), as well as meeting chairs Joseph Makdessi, MD, Sana Al-Sukhun, MD, and Nagi El Saghir, MD, and a group of expert speakers from Lebanon and Jordan. The collaboration between Lebanese and Jodanian oncologists was highly praised at the Opening Ceremony by all the speakers and participants. It was viewed as a great opportunity for continuing medical education, as well as networking and planning for research cooperation. Discussants were enthused about new and practice-changing data on immunotherapy and targeted therapy in lung cancer, head/neck, melanoma, bladder cancer, hematologic malignancies, breast, gynecologic, and gastrointestinal cancers, as well as all aspects of patient care and translational and clinical research. The importance of new advances, as well as relevant basic information for practicing oncologists in the Middle East, ethnic and geographic differences, and resource limitations were discussed in the Q&A allotted time. Cooperation between medical societies, universities, health authorities, and ministries of health was highlighted in the Opening Ceremony in order to ensure dissemination and implementation of new data and guidelines to promote evidence-based oncology medicine and cost containment. In addition to Lebanon and Jordan, there were a large number of oncologists from Syria participating in the meeting. Syrian oncologists, who practice medicine under the very difficult conditions of war and shortages, were very happy to participate and very interactive. In fact, at the Opening Ceremony, meeting chairs pointed out that the number of new cancer cases in Lebanon and Jordan has increased by 30% to 50% over the last 5 years because of the influx of Syrian refugees and also Iraqi patients escaping war and destruction in their countries. Many participants said they attended the meeting because they could not afford the cost of travel to the ASCO Annual Meeting, or could not get a visa to go to the United States. Interestingly, a few oncologists said they came to Lebanon from the U.S. because they were unable to go to Chicago, either because of their schedules or that they were on call covering colleagues who attended the ASCO Annual Meeting. Many people said they attended both ASCO and Best of ASCO meetings. They acknowledged an added value for Best of ASCO meetings as they provide opportunities to attend all selected important presentations in one conference room (something that is extremely difficult at the ASCO Annual Meeting in Chicago, where there are hundreds of oral presentations and lecture venues), in addition to more chances for one-on-one discussions with speakers. We were proud to have an ASCO International Development and Education Award (IDEA) grant recipient, Mohammed A. Suwaid, MD, a medical oncologist from Iraq, attend Best of ASCO Lebanon in Beirut. As part of his ASCO IDEA grant, Dr. Suwaid was hosted the following week by his mentor Dr. El Saghir at the American University of Beirut Medical Center (@AUBMC_Official). Best of ASCO Lebanon provided a good networking venue for people to get to know each other better. LSMO and JOS agreed to consolidation and cooperation in organizing medical oncology conferences and conducting research together. Other medical societies in the region expressed desire to join in next year: Stay tuned! Dr. Al-Sukhun is president of JOS, a member of the ASCO International Affairs Committee, and co-chair of the Best of ASCO Lebanon. 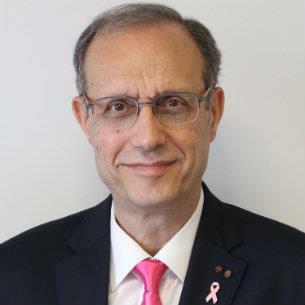 Dr. Makdessi is president of LSMO and co-chair of the Best of ASCO Lebanon.